Itching for Books: CARRIE NYMAN'S BLOG TOUR WRAPS! 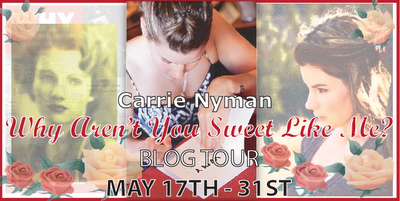 CARRIE NYMAN'S BLOG TOUR WRAPS! I'm happy to say that as my first hosted blog tour ever, I'm thrilled that it went well. THANK YOU so much to the participating bloggers who helped to promote this talented author and her amazing novel. Your contribution on this tour is beyond appreciative. Be sure to purchase the book if you haven't yet. If you missed any of the stops please check them out here. Once again, thank you to all the participants! Labels: Blog Tours, Carrie Nyman, Tour Wrap, Why Aren't You Sweet Like Me? I know you already saw it, but still thought I'd come around and congratulate you on being awarded the Booker Award from the Diaires! Love your blog!